First, you will need to frost the glass jar. Follow the directions on the back of the spray can. Make sure to do this outside. Also, do NOT frost the top of the jar. You will need this to be clear for the solar panel. 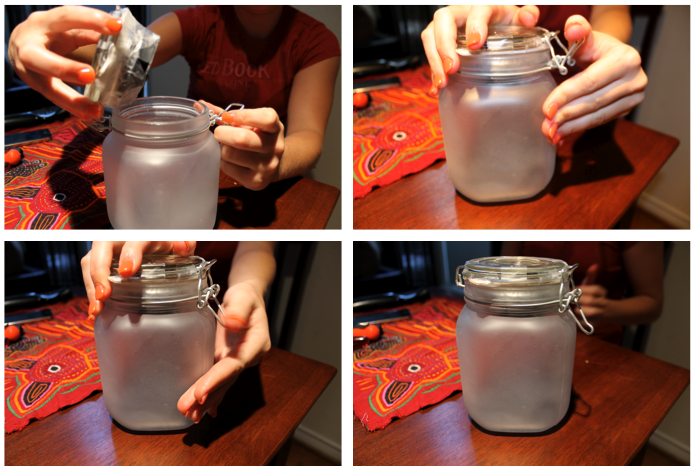 To avoid frosting the top of the jar, you can wrap a plastic bag around it and tie it off with a twist tie, like we did. 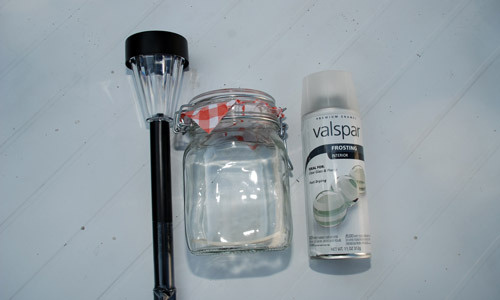 Spray the frost onto the outside of the jar. Let dry. Make sure to spray the bottom of the jar, once the first coat is dry. Pull the top off of the path light. (Just the solar panel part.) Take the battery out, to be safe while working on cutting everything out. You will need to unscrew the back off of the solar panel. If you do not have a screwdriver small enough, you can improvise and use a knife like we did. Just be careful. Cut the plastic around the solar panel. You may need to use pliers to bend the metal back. Try to remove as much plastic as possible. You just want the solar panel. WARNING: METAL CAN BE SHARP!! Cut the excess plastic around the battery and wires. Cut as much off as you can, you want it to be able to fit inside the jar lid. Tape the solar panel into the top of the jar. Close the lid of the jar. Let sit in the sun to charge.